Those three days between the end of the World Cup and the start of my football season were some of the most challenging of my life. Yes, it was almost certainly the best tournament I had lived through but nothing ever really beats being at an actual game. I was excited to start at a new ground in Bo’ness and of course with a new pie review as I followed my team Pollok east for some friendly action. Imagine then my disappointment as I scanned the terraces of Newtown Park to see that my post work dash to West Lothian was not going to be rewarded with a meat filled pastry dinner. I really hoped this wasn’t going to be a sign of things to come. Fast forward to the following Saturday and a message exchange with my Kilmarnock supporting mate from uni saw me off to Dumbarton. Going “undercover” as an away fan is always a unique experience, the fans tend to be that little bit more boisterous, fuelled by a travel beer or two, the characters slightly more eclectic and the whole day just that little bit more enjoyable than taking seat with some of the home team regulars. Despite the pies selling out at half time due to the volume of travelling fans I had snagged a pie just past the half hour mark, and with it securely wrapped inside my paw I welcome you to Season 6 of Meat Filled Pastries with Pie 138: The Dumbarton Steak & Gravy Pie. Price: As it was the first pie of a new season I thought I would treat myself to a little bit of luxury but at a whopping £2.60 – a full 70p more than a scotch pie – I was slightly aghast. Now maybe it’s because this was the first game of the season but when I looked up at the price board an audible “whit!” could be heard coming out my mouth. Remember this is Scottish League One fayre, not Ibrox or Parkhead. I was quite taken aback. Presentation: A common presentation style for a steak based pie of a tinfoil case and medium-sized white napkin although the mis-shapen nature of the case (more pear shaped than round) should have hinted about the taste experience that was about to follow. Meatiness: The meat content of this pie was dispersed in some what of a higgledy piggledy manner meaning that at one side you were biting into some pastry lightly tickled by gravy whilst at the other there was a wealth of meaty treasure to be found. Various sized chunks of meat wrapped in a well seasoned if not particularly mind-blowing gravy. The meat was cooked well but didn’t leave you yearning for more nor wishing you’d never took a bite. It was just there. Pastry: The pastry was on the surface fine. A nice golden tinge to the edges although the top was perhaps looking a little under-baked. The side walls had cracked quite a bit leaving its structural integrity in question but all in all it was holding and seemed passable without being in any danger of making it on “the best pies I have eaten” list. Then I took a bite. A bite of raw, sticking to the tinfoil bottom layer of something that was…well it was awful. Claggy to the bite and with the ability to roll it up in a ball between my fingers. By the time I had finished my pie I needed more than a few slurps of fizzy pop to wash my mouth clean and seperate the paste from my teeth. Poor. Brown Sauce: Just a reminder that luxury pies require no brown sauce although in this instance it may have helped with the pastry. Gravy Factor: We were on our way to an OK steak and gravy pie, with a golden if under-baked top and a decent filling however that base. That mush of paste masquerading as pastry was the definition of, no nice. Well I hope that’s not the season standard going forward. Luckily we have an early shot at redemption as I headed to Fife to take in a pre-season friendly between Kelty Hearts and Brora Rangers and of course scran a pie. I’ll keep you posted if anything interesting happens along the way, however, until next time go forth and eat pie. Just maybe not this one. One last thing. If you like football and scran then follow me on Twitter @MFPTasty and for a more food and travel based experience then have a look in Twitter for @mershdoes. Chris Marshall, is a BJTC accredited Radio Journalist with an honours degree in Communications & Mass Media from Glasgow Caledonian University. He has contributed to prominent football sites including Pie & Bovril, The Terrace Podcast, The Football Pink and The FBA’s as well as featuring in The Scotsman, STV and a number of other media outlets. A perennial ‘Scottish Sporting Optimist’ and part-time Madrileno with a passion for food that has manifest itself in the wonder that is Meat Filled Pastries. 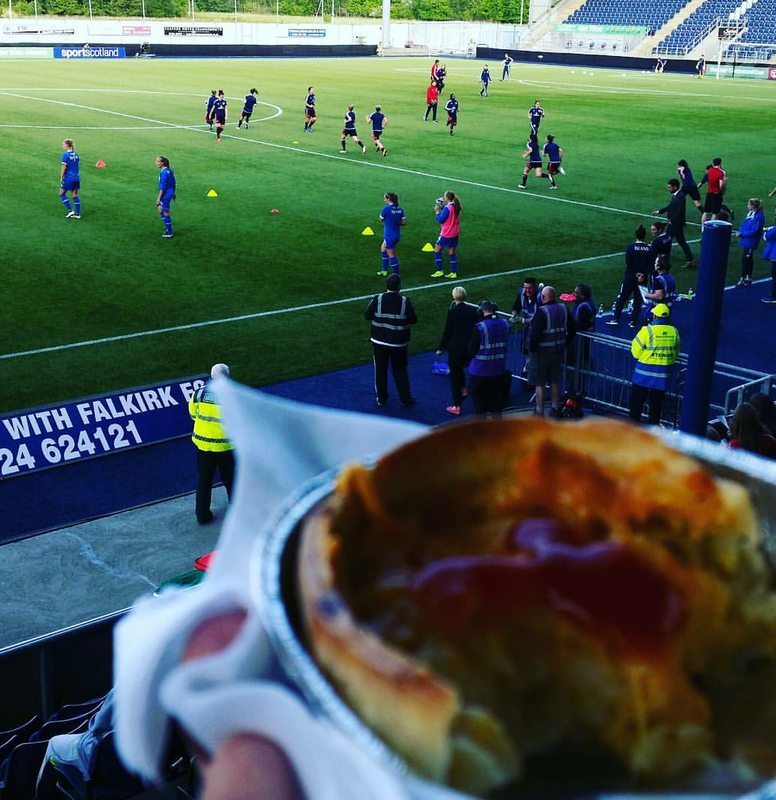 This entry was posted in Football Pies, Professional Pies, Sporting Pies, The Life of Pie and tagged betfred cup, dumbarton, food blog, Football, football blog, killie, kilmarnock, meat filled pastries, pastry, Pie, scottish football, steak and gravy, steak pie, the sons. Welcome back to another edition of Meat Filled Pastries where we’re always on the hunt for some meaty thrills whilst holding back on the spills because a spilled pie leads to a sad guy. Now unless you’ve been living under a rock for the last couple of weeks we have seen the dawning of a new year and with it the thoughts of new hopes and expectations that it will bring. I’m not one for the phrase “New Year, New Me” philosophy that blights social media for those first few days of January but I do see it as an opportunity to set some goals and try new things. It’s also the time of year where people declare their body a temple and health boards and charities across the country champion well-meaning campaigns such as “Dry January” and the awfully named “Veganuary”. Now this may perhaps come as a surprise to some but I am quite happy to eat a meal without meat, in fact when you consume the volume of Meat Filled Pastries that I do it is somewhat of a treat. However with that being said I cannot get on board with replacements such as “Facon” and “Tofurky”. I’ve got in to many a debate about this with non-meat eating friends before but for me if you don’t want to eat meat why are you then replacing it with things that look and (supposedly) taste like the things they don’t have any interest in eating? It’s an endless riddle to me. Most vegetarians are sound and rational people. Most vegans however, are in my experience (bar the odd exception), raving lunatics who must burn all of the 150 calories they consume a day telling the world that if you eat meat you deserve to burn in the depths of hell for having the audacity to like the occasional chicken nugget. It’s not my fault you’ve chosen a life of cauliflower “steaks”. I accept that as your life decision so don’t come preaching, and I mean preaching, to me because I don’t agree. All of which, kind of ironically, brings us to today’s pie review; The Queen’s Park Cheese & Onion Pie, a veggie (but not vegan) friendly option at the much debated home of Scottish football Hampden Park. Price: A whooping £2.70. For a pie with zero meat in it. Now I’m making an assumption here but I’m guessing that pie prices for Queen’s Park games are dictated by someone other than the club as history has shown that a pie at a Scotland game will cost you exactly the same for a (supposedly) much higher level of football. I’m not even going to begin to claim to the understand the economics behind Queen’s Park playing at Hampden, and for what it’s worth I think they should continue to do so, but £2.70 for a pie definitely needs looking at when compared with their League One peers. Presentation: The tin foil case of potential doom accompanied by a large white napkin for mopping up at this point the unknown treasures within. Meatiness Cheesy-Onionyness: Sigh. This was fairly rubbish. Always a disappointment in the pie game. Inside this pie was a mushy yellow and white paste that I presume was meant to be rich and cheesy with a strong onion linger in the background oozing as you pull away each bite and where you try to stop a small string of cheese getting stuck in your beard. Positively dreamy. Pastry: I have often talked about the pit falls of the tin foil case. A Sophie’s Choice of a decision for butchers and bakers between the appearance of uniformity and the risk of the pie sticking to the bottom of the case. It’s a risk that often backfires and in this instance the result was no different as half my pie stayed glued to the bottom as I lifted it to take my first bite. The pastry on the top edges was golden and crisp but at the base was as near to raw as I think I’ve ever had at a football game. So raw infact, that I could actually leave a thumbprint in the bottom with the mixture of filling and pastry creating a texture that I’m sure could be used as a Play-doh substitute at a nursery. I can’t think of the last time I thought, “I might not even finish this” but it was really that poor. I am however a trooper, and so I powered through like any good pie muncher should. Brown Sauce: Regular readers will know that a luxury pie (i.e. a non-Scotch Pie) does not get dotted with some of the brown stuff but given how consumption had gone to this point I thought I’d grab a sachet to try and save it. Sadly, even this most wondrous of condiments couldn’t prevent me from experiencing culinary doom. Overall: This was not very good. The filling was bland but yet somehow offensive and the pastry was near raw and stuck to the case. If you go to a Queen’s Park game I’d avoid this and stick to your traditional Scotch or Steak. If you’re feeling fancy wire into a Chicken Curry but if you’re a vegetarian I’d just settle for a Mars Bar. Gravy Factor: Literally better off eating a spoonful of unwatered Bisto. Well that was disappointing. It’s often said it’s easier to criticise than praise but for me the purpose of this site is to champion the best pies around the grounds and beyond and so when I’m met with something bad it’s a chore to break it down. That said, if I’m not honest and go about proclaiming every pie as the greatest I’ve ever had then I lose all credapie-ility. Next up is a first review from Clydebank, something I couldn’t quite believe when checking the archives before the game so hopeful we see a return to pie glory. But until next time, go forth and eat pie! This entry was posted in Meatfree Pastries, Professional Pies, Sporting Pies, The Life of Pie and tagged albion rovers, cheeseandonion, Football, hampden, meat filled pastries, meatfree, pastries, Pie, queens park, scottish football.